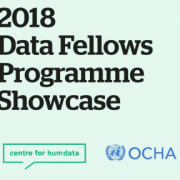 You’re invited to a reception showcasing the work of the UN OCHA Centre for Humanitarian Data’s inaugural class of Data Fellows! The event will take place from 16:00 – 17:30 on Thursday, 26 July at the The Hague Humanity Hub. The Data Fellows will present the outcomes of their research projects and then participate in a moderated discussion on data in the humanitarian sector with Ben Parker, Senior Editor at IRIN News. Light refreshments including beer and wine will be served. We look forward to seeing you! Registration is required no later than Friday, 20 July by emailing centrehumdata@un.org.